At one point in the rollicking chase film Baby Driver, we learn of a (fictional) figure of Atlanta urban legend called "The Spirit of 85." Apparently an enigmatic joyrider led local law enforcement on high-speed pursuits around Spaghetti Junction and other interstates, but was never caught. Commuters used to the city's rush hour may look to The Spirit of 85 with envy. But as viewers of Baby Driver discover almost immediately, the legendary wheelman is not a furious, Vin Diesel-type road warrior, but a soft-spoken young dude shielded behind sunglasses and ear buds. As a getaway driver for bank heists, Baby (Ansel Elgort) lives for breaking the speed limit but only reluctantly takes part in crimes. Baby longs to slip his underworld ties and drive west on I-20 for a new life in a film that unfolds like a fast-forward love letter to cars, pop songs, musicals and Atlanta itself. At one point, he listens to a soul song while walking from Octane Coffee to the gang's hideout, all the while singing and half-dancing along, even passing graffiti that matches the tracks "yeahs" and "whoas." During chases and action scenes, director Edgar Wright and the film's editors match the rhythms of what we hear to what we see: In one case, the rattle of assault rifles provide a counterpoint to crunchy guitar riffs. Baby Driver is not quite a traditional musical, but it's not not a musical, either. At a '50s-style diner he meets young waitress Deborah (Lily James) and they bond over a love of music, comparing the quantity of "Deborah songs" to "baby songs." Elgort gives the film a charming anchor, displaying a little of the charisma of a young Elvis Presley. James conveys Deborah's sweetness and decency but proves less well-rounded, like a d love interest who needs protection. Baby tries to settle a longstanding debt with master planner Doc (Kevin Spacey, effectively icy), who blackmails him into a final score. He teams with Darling and Buddy (Eiza Gonzalez and scene-stealer Jon Hamm), married thieves who can't keep their hands off each other, as well as livewire Bats (Jamie Foxx), a stick-up artist who distrusts Baby on sight. 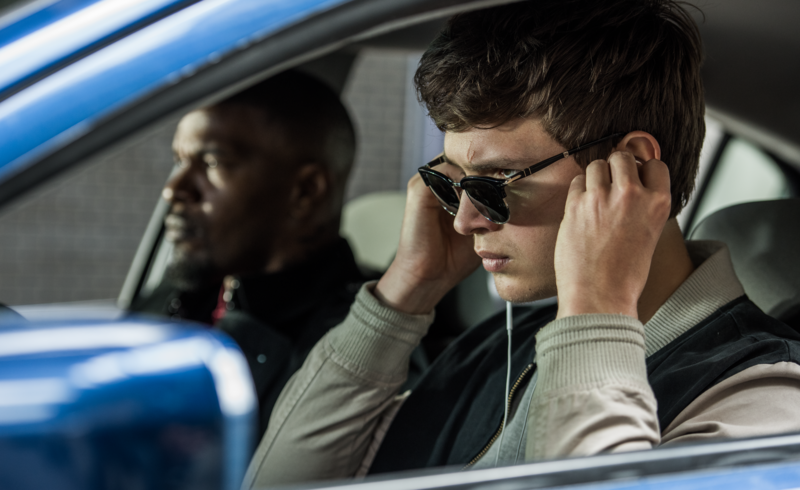 After a deliriously entertaining first act, Baby Driver downshifts for much of its second half for tense cat-and-mouse scenes as Baby tries to think his way safely from his predicament and the thieves keep testing his loyalty. Though Wright seems to be setting up a massive chase for the climax, the script takes some unexpected detours that are more focused on theme and character, undermining some viewer expectations. Wright directed a modern classic trilogy of genre comedies Shaun of the Dead, Hot Fuzz and The World's End and he still crafts snappy dialogue. A pre-heist argument about Halloween masks is an instant classic. But Baby Driver is his first script as sole writer (he usually collaborates with actor Simon Pegg), and the jokes thin out a bit in its second half. It has the same energy as his best work but not quite as many laughs. When the production settled on shooting Baby Driver in Atlanta, Wright rewrote the film to be set here and embrace Atlanta as a location. Audiences who know the city will delight in chases through familiar neighborhoods (look, there's Mercedes-Benz stadium under construction!) and scenes at local landmarks like Bacchanalia. You don't have to be an Atlantan to groove to Baby Driver it's just the cherry on top of the dessert. Baby Driver. 4 stars. Directed by Edgar Wright. Stars Ansel Elgort, Lily James. Rated R. Opens June 28. At area theaters.